The Farmers Union, officially the Farmers Educational and Cooperative Union, was organized in Texas in 1902 to improve the educational, economic, social, and political condition of southern farmers. In 1905 S. H. Colwick of Texas moved to Cleveland County, N.C., and by 1906 he had organized 11 local Farmers Unions, which then formed the Cleveland County Farmers Union. 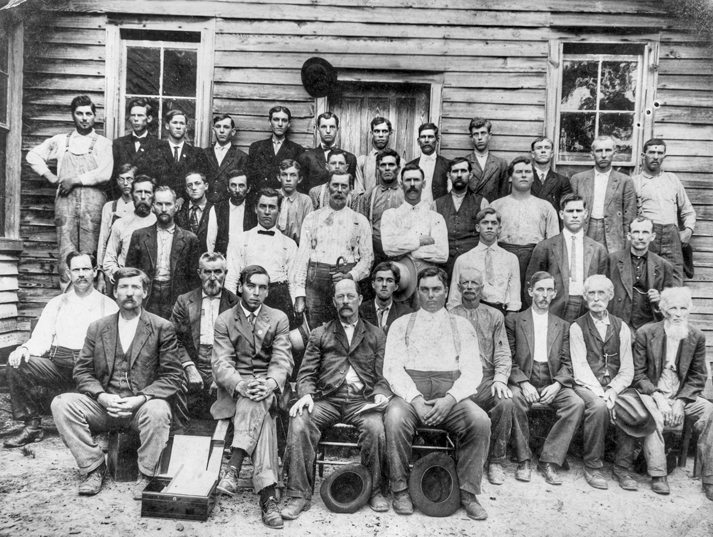 The national union sent organizers into North Carolina in 1907, and growth in membership was sufficiently rapid to spark publication of the Carolina Union Farmer in Charlotte that same year. The following year the North Carolina division of the Farmers Union was organized in Charlotte. By 1912, the year of the union's greatest strength, the organization had 33,000 members in the state, numbers it was unable to maintain. In 1913 the Carolina Union Farmer was sold to the Progressive Farmer, which in turn promised to publish items of specific interest to the Farmers Union. In 1919 the North Carolina division withdrew its membership from the national union in protest over the amount demanded for national dues ($100). In its heyday, the state union lobbied for the creation of farm-life schools in 1911, organized farmers' cooperatives, and pressed for a system of rural credit. It provided social activities in the form of picnics, rallies, and monthly meetings. The state union was unable, however, to sustain the cooperatives, compete with other farm organizations, or hold onto its local unions and membership. The North Carolina Farmers Union was defunct by the close of 1928. John A. Crampton, The National Farmers Union: Ideology of a Pressure Group (1965). Barrett, Charles Simon. "North Carolina." The mission, history and times of the Farmers' union; a narrative of the greatest industrial-agricultural organization in history and its makers. Nashville, Tenn.: Marshall & Bruce co. 1909. p.248-249. http://archive.org/stream/missionhistoryti00barr#page/248/mode/2up (accessed October 18, 2012). Fisher, Commodore B. The farmers' union. Lexington: The University of Kentucky. 1920. http://archive.org/details/cu31924013716778 (accessed October 18, 2012). Davis, A. C. Co-operative enterprises of the Farmers' Union. Texarkana: Union Label Press Courier. 1910.
http://archive.org/stream/cu31924094778895#page/n17/mode/2up (accessed October 18, 2012). Members of the Farmers Union photographed at Erwin Chapel near Erwin in Harnett County, ca. 1905. North Carolina Collection, University of North Carolina at Chapel Hill Library. I have a paper showing 2 shares of capital stock in "The Farmers Union Wholesale and Retail Co. of Anson Inc.," dated Oct. 31, 1910 issued in Wadesboro, N.C.
Do you know the history of this or where I can find it? Thank you for visiting NCpedia and sharing your artifact. I am forwarding your question to reference services at the NC Government & Heritage Library and a librarian will contact you shortly to help with your question.